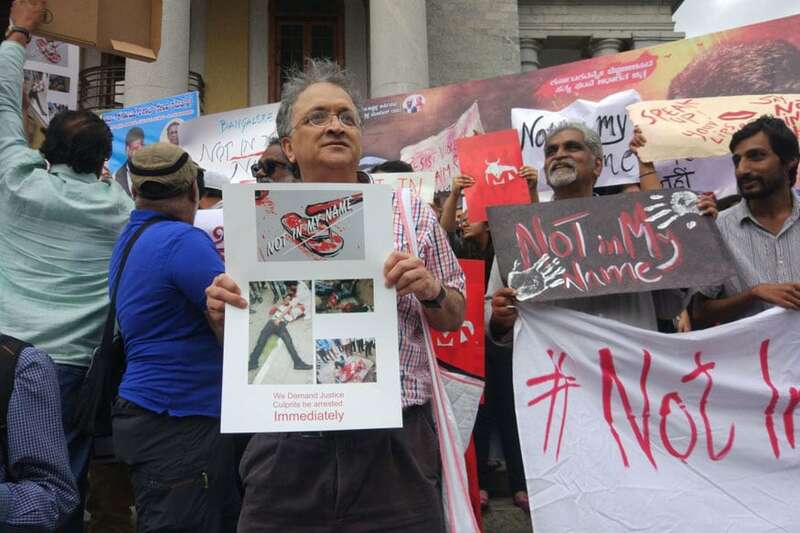 Nearly 400 citizens came together to speak out in ‘NotInMyName’ campaign against lynch mobbing incidents that have been reported from different places. Bengaluru: Nearly 400 citizens came together to speak out in ‘NotInMyName’ campaign against lynch mobbing incidents that have been reported from different places. Among them were eminent writers Ramachandra Guha and Girish Karnad, people from NGOs, IT companies, lawyers and activists, students and home makers. "This is a question of fundamental rights. We have to speak out when our own people are being denied that," said one protester. Many wore black, others carried pictures of cows with #NotInMyName written over it. People sought to distance themselves from the violence unleashed over 'protection of cows ', calling out right-wing hardliners' stand over the bloodshed the country has been witnessing. "You have to protest against any kind of injustice against fellow Indians. That’s all. We have a Constitution, we have law and order and it is terrible that it is happening. We know why it is happening, it is happening for political purposes. It is not for religious purposes," said a visibly upset Jnanpith awardee writer Girish Karnad who come briefly for the protest. Asked if the silence of many over lynching incidents may have encouraged the mobs more, Karnad said, "That's why we are here, that's why we must protest. It could be someone else now, it could be us the next time." Many felt that the killing of teenager Junaid was perhaps the tipping point that led to the social media campaign that ultimately resulted in the multi city rallies.